Schuster, R., Simões, T., den Brave, F. and Escobar-Henriques, M. (2018). Separation and Visualization of Low Abundant Ubiquitylated Forms. Bio-protocol 8(22): e3081. DOI: 10.21769/BioProtoc.3081. Simoes, T., Schuster, R., den Brave, F. and Escobar-Henriques, M. (2018). Cdc48 regulates a deubiquitylase cascade critical for mitochondrial fusion. Elife 7: e30015. In this protocol we describe the separation and visualization of ubiquitylated forms of the yeast mitofusin Fzo1 by Western blot. To this aim, we express HA-tagged Fzo1 in Saccharomyces cerevisiae, break the cells to extract a membrane-enriched fraction, solubilize the membranes using detergent and then specifically immunoprecipitate the tagged protein using anti-HA affinity beads. Subsequently, we separate the higher molecular weight (ubiquitylated) forms of Fzo1 via SDS-PAGE. Finally, immunoblotting and immunodecoration are used to detect the protein and its ubiquitylated forms using an HA-specific antibody. By using this protocol, it is possible to separate and visualize higher molecular weight forms of low abundant proteins such as Fzo1 and detect sharp and distinct bands above the unmodified protein by Western blot. Immunoprecipitation is a method to precipitate and enrich a protein from an extract by using an antibody specifically binding to it. 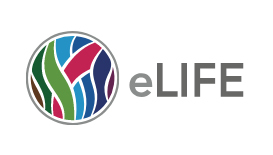 The enrichment of a protein is of particular importance when analyzing lower abundant modified forms of it, as is usually the case for ubiquitylated forms of a protein. 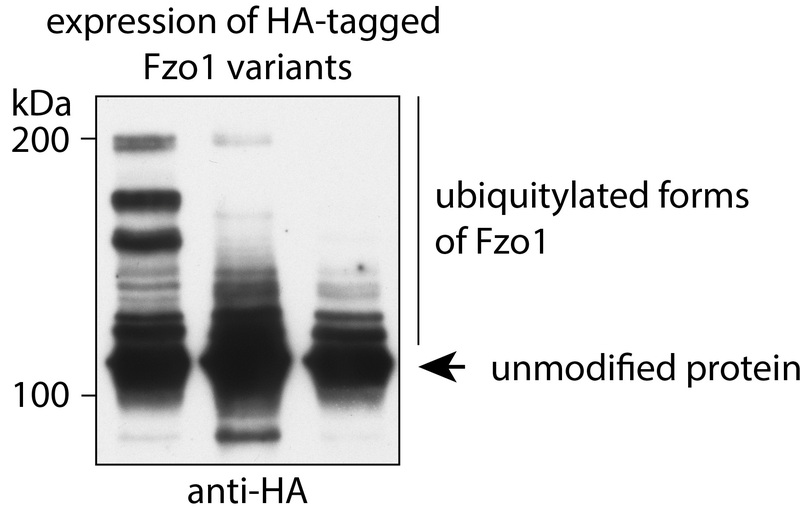 To be able to enrich for the ubiquitylated Fzo1 protein we tagged the protein with a Hemagglutinin (HA) epitope and use anti-HA affinity beads to precipitate this modified protein from the solubilized membrane fraction. This allows for the detection of the less abundant ubiquitylated forms of proteins as for example Fzo1 (Anton et al., 2011 and 2013; Simoes et al., 2018). Note: This protocol is also applicable to other yeasts strains. Inoculate cells in 50 ml selective minimal media supplemented with glucose (2%, w/v) and grow overnight to the exponential growth phase (less than 2 OD600 density) at 30 °C by shaking at 160 rpm. In the morning, inoculate 160 ml selective minimal media supplemented with glucose with a starting OD600 of 0.3 for 4-6 h to the exponential growth phase (less than 2 OD600 density). Harvest 160 OD600 of these exponentially growing cells per condition using 50 ml conical tubes by centrifuging (5 min, 4,100 x g, RT). Discard supernatant. Resuspend the pellets in 1 ml TBS buffer and transfer the suspension to two 2 ml round-bottom centrifugation tubes and centrifuge (1 min, 16,100 x g, 4 °C). Discard supernatant. Note: Proceed with all following steps on ice. Resuspend pellets in 300 µl TBS buffer each. Add 750 mg glass beads, 10 µl 0.2 M PMSF and 20 µl 50x cOmpleteTM EDTA-free protease inhibitor to each suspension. Disrupt the cells by vigorous vortexing using the highest setting (Vortex) (3x 30 s vortexing, 30 s on ice, alternating). Pool the two suspensions of corresponding conditions. Add 400 µl TBS buffer. Centrifuge mildly (2 min, 1,500 x g, 4 °C). Transfer the supernatant to a new 1.5 ml centrifugation tube. Centrifuge (15 min, 16,100 x g, 4 °C). Discard supernatant. Resuspend the pellet (= crude membranes) in cold 0.2% NG310 in TBS buffer. Solubilize the membranes by continuously rotating the tube (1 h, 10 rpm, 4 °C) using a rotator. Input control (In): 20 µl 2x Sample buffer with freshly added 0.1 M DTT. Immunoprecipitation (IP): 500 µl 0.2% NG310 in TBS buffer + 23 µl Anti-HA Affinity Gel (wash the Anti-HA Affinity Gel once with TBS buffer before adding it). After solubilization, centrifuge (5 min, 16,100 x g, 4 °C). Take 20 µl of the supernatant as input control (= 4%), mix it with the 2x sample buffer in the prepared tube (In) and freeze until use at -20 °C. Add the remaining supernatant to the prepared IP tube and rotate the tube (overnight, 10 rpm, 4 °C) using a rotator. (Day 3) Centrifuge IP tube (30 s, 400 x g, 4 °C). The Anti-HA Affinity Gel consists of small gelatinous beads. As not to aspirate the beads use a syringe with a small opening or thin capillary pipette tips (refer to Equipment section for details). Wash the Anti-HA Affinity Gel with 0.2% NG310 in TBS buffer. Repeat washing 3 x (Steps B16-B18). Add 60 µl 2x sample buffer with freshly added 0.1 M DTT. Thaw the input control on ice. Heat samples using a thermomixer (20 min, 1,400 rpm, 45 °C). Centrifuge (30 s, 1,500 x g, RT). Assemble gel equipment according to manufacturer’s instructions (see Equipment section for details). Prepare separation and stacking gel mixtures (do not add APS and TEMED yet as it will start the polymerization process). Add APS and TEMED to the separation gel mixture and mix well. For each gel, with a pipette, rapidly pour 9 ml of the separation gel mix between the two glass plates and overlay each with 1 ml of isopropanol to even out the surface. Keep the remaining gel mixture and use it to control the polymerization status. After polymerization, decant the isopropanol and wash with water carefully. Remove excess water with filter paper. Put in the combs, leaving 3-5 mm distance from the separation gel. Add APS and TEMED to the stacking gel mixture and mix well. Rapidly pour the stacking gel mixture on top, making sure that no bubbles appear in the stacking gel. Keep the remaining gel mixture and use it to control the polymerization status. After polymerization, remove the comb and fill the slots with 1x Tris-Glycine buffer. Load samples (e.g., 4% Input control and 100% eluate) and a pre-stained protein marker of choice (e.g., NEB, P7712). Fill SDS-PAGE tank with Tris-Glycine buffer to the filling line (anode). Insert gels into the tank as per manufacturer’s instructions (make sure that the bottom parts of the gels are in contact with the anode buffer). Fill cathode reservoir with enough Tris-Glycine buffer to cover the cathode. Note: To make sure that the higher molecular weight ubiquitylation bands will be separated efficiently the unmodified protein needs to run as far as possible. Disassemble the gels by removing them from the tanks and by taking the glass plates apart carefully with the plastic wedge coming with the SDS-PAGE electrophoresis unit. Cut off the stacking gel with the plastic wedge. Soak six filter papers, one nitrocellulose membrane and the separation gel briefly in transfer buffer. Assemble western blotting sandwich as described from plus to minus pole: three filter papers, one nitrocellulose membrane, gel, three filter papers. Between each layer, carefully remove bubbles by rolling over the sandwich with a rolling pin (e.g., a round pen or a short serological pipette). Run the transfer for 2 h for 2 mA per cm2 gel/membrane (i.e., for one 7 x 15 cm gel: 2 h, 200 mA). Wash the membrane with desalted water, stain the proteins with Ponceau S solution and scan the membranes (only the input control will show a staining), destain using TBS buffer, block the membranes at room temperature for 30 min in 5% milk in TBS buffer, all steps while shaking at 40 rpm using a tumbling table. Perform immunodecoration to detect the HA epitope (Steps a-d require shaking at 40 rpm on a tumbling table). A representative image is shown in Figure 1. Replace the blocking solution with the primary antibody solution: 1:1,000 anti-HA in 5% milk in TBS buffer and 0.02% NaN3 and incubate overnight at 4 °C. Remove the primary antibody solution (can be stored at -20 °C if desired) and wash 3 x using TBS buffer at room temperature for 10 min each. Replace the TBS buffer with the secondary antibody solution: 1:5,000 anti-rat in 5% milk in TBS buffer for 2 h incubation at room temperature. Wash 3 x for 10 min using TBS buffer at room temperature. Tilt the membrane after the last wash to remove excess liquid. Place membrane in a flat container. Mix equal amounts of solutions A and B (e.g., 1 ml total volume) of ECL and repeatedly spread over the membrane (for 30 s). Tilt the membrane to remove excess liquid, place it in an autoradiography cassette and cover with a transparent plastic foil. Proceed quickly now as the signal may rapidly fade and also because big amounts of protein may burn the membranes irreparably. Note: For big amounts of protein as here, the membrane will most likely burn at the position of the unmodified protein, therefore the development of the membrane will not be repeatable without quality loss. In a film developing room (only red light! ), place unexposed X-Ray films on the membrane for varying durations, starting with short exposures (e.g., from 1 s to 30 min). Place and remove them in a fast movement without sliding across the membrane to get a sharp signal. Use a developer machine to develop the films. Funding: Deutsche Forschungsgemeinschaft (ES338/3-1); Universität zu Köln (German Excellence Initiative and Faculty of Mathematics and Natural Sciences); Deutsche Forschungsgemeinschaft (SFB635); Deutsche Forschungsgemeinschaft (CRC1218TPA03). The authors declare they have no conflict of interest or competing interests. Anton, F., Dittmar, G., Langer, T. and Escobar-Henriques, M. (2013). Two deubiquitylases act on mitofusin and regulate mitochondrial fusion along independent pathways. Mol Cell 49(3): 487-498. Anton, F., Fres, J. M., Schauss, A., Pinson, B., Praefcke, G. J., Langer, T. and Escobar-Henriques, M. (2011). Ugo1 and Mdm30 act sequentially during Fzo1-mediated mitochondrial outer membrane fusion. J Cell Sci 124(Pt 7): 1126-1135. Copyright Schuster et al. This article is distributed under the terms of the Creative Commons Attribution License (CC BY 4.0).